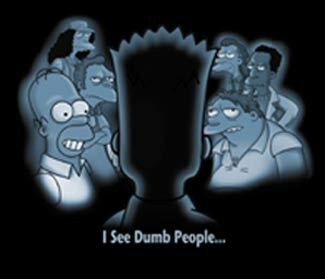 I See Dumb People - Bart Simpson quotation tshirt. Not shown, but printed down the side of 1 sleeve are red, raised ink line drawings of Homer, Otto, and the other characters seated across the table from Bart. Long Sleeves, 100% cotton, black. Only Youth Sizes Small and Med left in stock. Bart Simpson quotation tshirt. I See Dumb People.